From its tongue-in-cheek title to its choice of star, the first movie in a decade from action vet Walter Hill ( The Warriors , 48 Hrs ) offers no pretensions: it’s unashamedly a brain-ejecting excuse to watch Sylvester Stallone shoot people in the face. It’s a sell that delivers, but not without distracting problems. Adapted from a French comic, Bullet focuses on the unlikely partnership between grizzly hitman Jimmy Bobo (Stallone) and young, by-the-book detective, Taylor Kwon (Sung Kang). They’re brought together to solve two murders; one soaked in the blood of Bobo’s underworld, the other that of Kwon’s corrupt establishment. It’s a promising set-up, but one let down by a woeful lack of chemistry. The limp, clichéd script deserves its share of the blame. 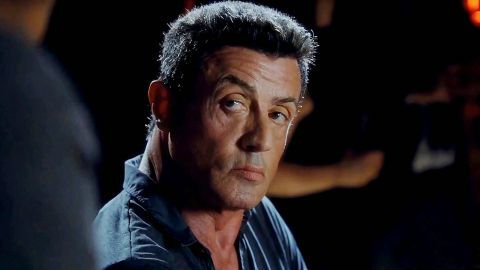 Even so, Stallone is able to turn around clunky one-liners and meandering dialogue exchanges with self-aware panache and presence. It’s Kang that’s the problem. Dull, awkward and bafflingly charisma-free, he turns into a whiny, unsympathetic drip that sinks not only the dynamic, but very nearly the entire movie. Next to Stallone, Kang may as well be made out of papier-mâché. Keeping things afloat is Jason Momoa’s Keegan: an assassin who stirs a genuine sense of danger whenever he’s on screen. His showdown with Bobo, fought with axes and pithy put-downs, is one of the few scenes where Bullet nails its ludicrous tone – a tone that otherwise comes across as hammy or, with its cheesy skyline shots, unintentionally hilarious. All well and good for harmless, brain-dead fun, but when it comes to the serious business of zoning out, there are better options.